Citrix Endpoint Management provides mobile application management (MAM) options so your organization can select the mobile app management strategy that’s best suited to meet your security and privacy requirements. Citrix Endpoint Management’s multi-containerization support allows you to use the MAM approach you need for your environment. This includes Citrix MAM-only approach, platform MAM - such as iOS Managed App Configurations, Android for Work/Enterprise, Samsung KNOX, Windows Information Protection and the AppConfig Community, and Microsoft Intune App Protection to manage Office 365 applications. The Citrix Endpoint Management MAM-only option provides application-level encryption and security policies that aren’t dependent on device security. This essentially provides an additional layer of security, so the risk of data loss is lower in the event a device is compromised. In addition, with Citrix Endpoint Management per-app encryption and containerization, enterprise apps are restricted from sharing data with personal apps. Users can continue to work productively, with the knowledge that their emails, contacts, web searches, and shared files are protected. The Citrix Endpoint Management MAM-only approach is ideal for BYOD situations where user privacy prohibits the use of an MDM client or device enrollment and management. Citrix MAM-only approach provides MAM features which sit on top of--or even instead of--those capabilities offered by platform MAM. The Citrix MAM-only option provides application-level encryption and security policies that aren’t dependent on device security. Citrix MAM-only approach is ideal for BYOD situations where user privacy prohibits the use of an MDM client or device enrollment and management. The advantage of Citrix MAM-only solution is not only MAM independence from MDM for BYOD, but a more consistent application of MAM policies across different devices and device operating systems. In addition, Citrix MAM provides micro-VPN security to protect data in transit. Citrix micro VPN I superior to device-level per-app VPN’s, as each app establishes its own micro VPN tunnel, protecting the enterprise network from any other applications on the device. When the app closes the VPN is removed. IT can even configure apps to use different gateways for different levels of authentication and authorization. Micro VPNs are not dependent on device enrollment. Citrix offered the most mature solution that met our business needs. 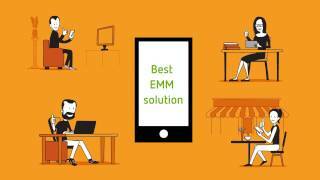 We saw XenMobile as the solution to managing the growing BYOD reality within the bank.